Huge Savings Item! Save 13% on the Blue Hills Studio SC10MC Storage Cart 10-Drawer (Standard) Multi-Colored by Blue Hills Studio at Momiji Studios. MPN: SC10-MC. Hurry! Limited time offer. Offer valid only while supplies last. BLUE HILLS STUDIO-Storage Carts. These rolling carts are ideal for storing large and small tools; embellishments; punches; stamps; paper and more. BLUE HILLS STUDIO-Storage Carts. These rolling carts are ideal for storing large and small tools; embellishments; punches; stamps; paper and more. The chrome frame and locking swivel casters are sturdy and stylish combined with the smoke colored or multi-colored drawers. This cart contains ten drawers (2-3/4 by 10-1/2 by 14-1/2-inch); measures 37.8 by 13.2 by 15.4-inch; is constructed of metal and plastic and requires quick and easy assembly. 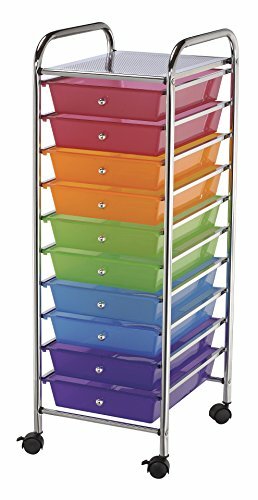 Colors: chrome frame with either multi-colored or Smoke colored drawers (each sold separately). Imported. Interlocking rail and drawer system. Each drawer can hold up to 3 pounds. 15 inches d x 11 1/4 inches w x 38 inches h.
If you have any questions about this product by Blue Hills Studio, contact us by completing and submitting the form below. If you are looking for a specif part number, please include it with your message.